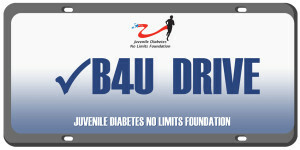 JDNL was founded with the goal to help teens and young adults with Type 1 diabetes lead inspired lives. Many people with T1D have chosen the path of “no limits” — they won’t allow diabetes to limit their activities in sports, their chosen career field or family activities. Diabetes is 24/7 – and while no cure exists, remarkable advancements have been made within the diabetes industry to help individuals monitor and manage diabetes with greater precision. Minimizing complications requires individuals with diabetes to ‘be in control’ and be responsible. Ask anyone with diabetes (or a parent of a child or teen with diabetes) and they will talk about how it can consumer their lives. As a young person reached driving age, they obtain more independence and must be less reliant on others for their diabetes care and management. When parents, teachers, coaches, school nurses, siblings and friends aren’t around to help, young people with T1D must be ready to ‘take over’. JDNL had the fortune of using the “driver training facility” of Dakota County Technical. This is an overview of the ‘course’ teens learned about driving control after having had sessions with a Certified Diabetes Instructor and a member of law enforcement. JDNL is different from foundations focusing on medical and scientific research for specific diseases. Information they provide is important and we encourage you to visit their websites. JDNL’s goal is to bring T1D teens and young adults together in an interactive day-long event. And while Check B4U Drive is for T1D teens, it’s also for parents that worry about their T1D son or daughter venturing out and not having developed the mindset of being in control — and recognizing the signs of lows and highs. “No Limits” is possible when a young person with diabetes reaches an age where they will take control. As you review this website, you’ll learn more about Check B4U Drive, which we have conduced since 2010. We have the ongoing objective to bring Check B4U Drive to more locations across the U.S. If you are interested in helping us expand our ‘reach’, please consider creating a 2-3 person team in your area to help! Feel free to contact us to discuss it with us! * Check Back for 2019 Dates and Locations!